Ok, so if you wanna talk about dorky passions, I am a self confessed Gladiators fan. I loved the Australian "Gladiators" series back in the 90's but the reboot in 2007 was pretty weak; I do have to admit though that the US reboot of American Gladiators on FOX was pretty damn cool. I mean, it had my favourite female kickboxer Gina Carano at the helm, AND.. a reworked Nerf sponsored version of the game "Assault". Nerf Barricade RV-10: Finally makes it to US stores! The most enigmatic of all the new 2010 blaster range would have to be the Barricade RV-10; it's publicity was almost completely fueled by rumours and fanfare rather than any real advertising or marketing push. We managed to get our hands on one in August but it wasn't long till it became readily available in several other countries worldwide..except the US. 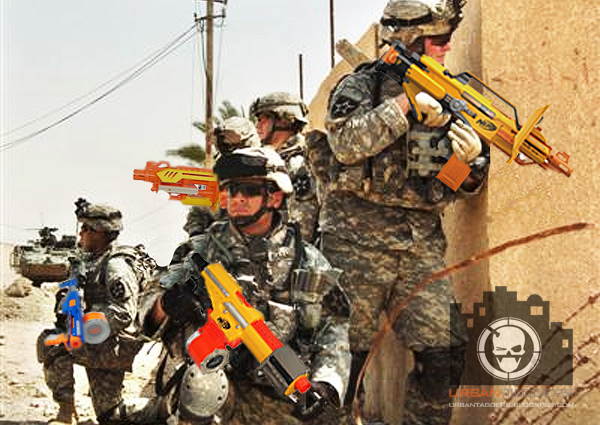 I gotta admit, this would have to be a first, and a rather bizarre decision by Nerf given for all intended purposes the US is their home turf?! 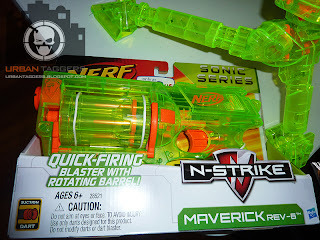 Sonic Series Maverick: Ok so I caved..
Soo, what does one do with himself at 9 in the morning after dropping the gf off at work other than a.... coincidental drive by to Toys R Us..
$14.95 AUS for one of these puppies. What can I say, I'm a completionist..
"Beginning in 2011, the Company will eliminate all wire ties from its packaging. In addition, for 2011 the Company has set a goal that at least 75 percent of its paper packaging will be derived from recycled material or sources that practice sustainable forest management." 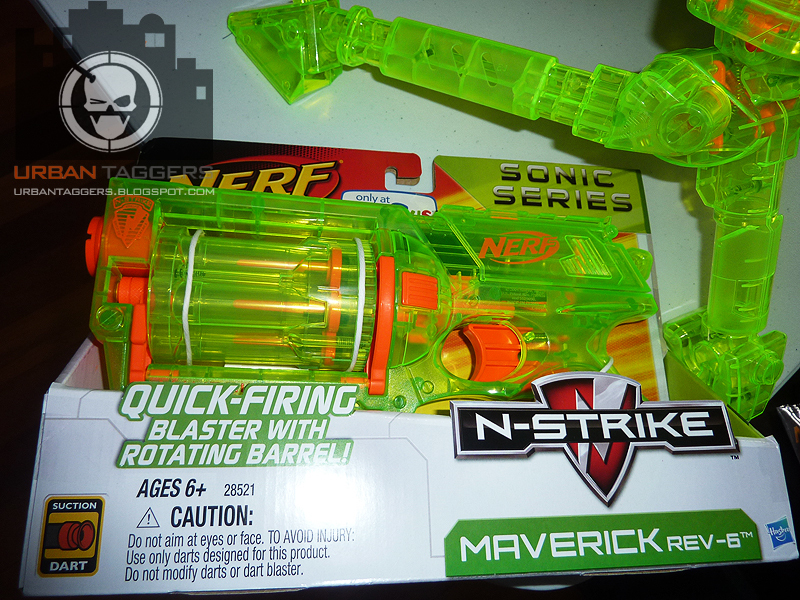 On opening my new Sonic Series Vulcan and Recon, I've noticed Nerf have gone one step further and done away with ties all together- it's now just cardboard holding the blaster in place. Niiice! And it's not even 2011 yet! Sonic Series now available in Australia! Oh yes.. 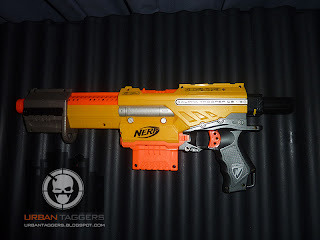 I couldn't resist..
Vulcan EBF 25 for $89, Recon for $49.95. 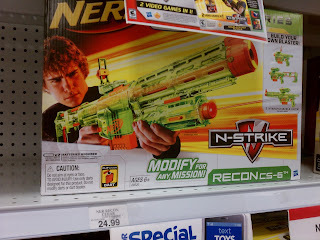 Sorta over priced, but it IS Toys R Us and given the fact it's exclusive.. I guess they can do what they want with the prices. It's all good and well to have a fully automatic blaster that can pump out the rounds quickly, but when it comes to dart tag, it's the single shot fire that'll get the win every time. So we figured we'd test the unreleased '20' out for single shot mode to see how it fares. This is where the jams occur; I'm not sure the motor is really designed to be SO stop -and- start. So whereas with full burst automatic fire we experienced very little dart jams, in single shot mode we probably ended up with on average 3-4 darts misfiring or jamming. Anyone have this experience with their Stampedes or Vulcans? 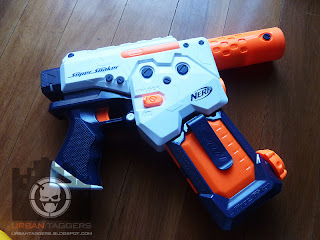 We go to great lengths to bring you genuine news and information on blasters as they come and we've managed to be able to score ourselves a unit to review...which we're pretty happy with. Soo.. here we go! 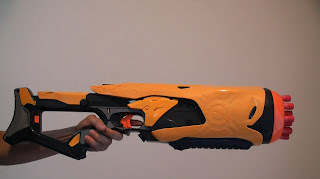 The blaster CAN jam like any other Nerf blaster, but it's normally to do with the darts you use and the way they're inserted; I've tested it with multiple types of darts and I find whistlers are probably the best (or the dart tag velcro tipped ammo). 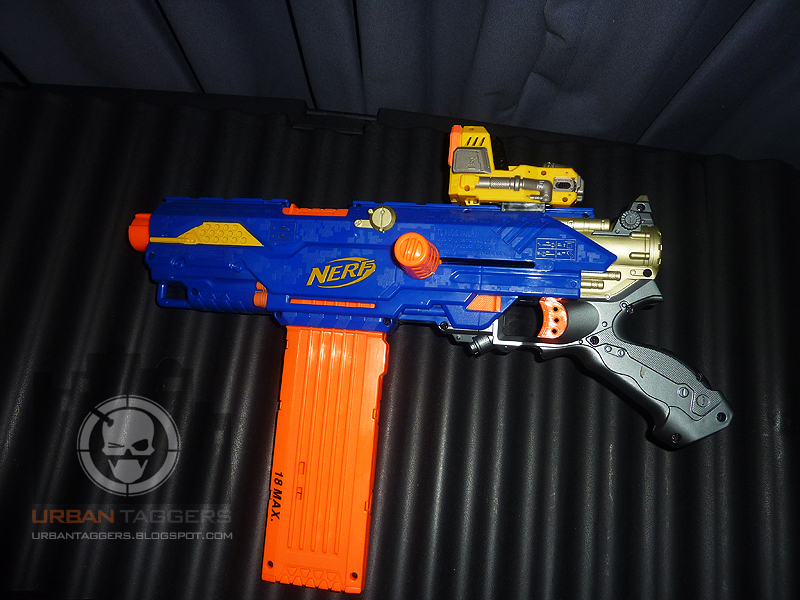 SO far I've gone through nearly 100 rounds and batteries still seem to be going strong. Soo check it out, Jermaine from Nerf Mods + Reviews was lucky to get his hands on some of the Sonic Series... have a look see for more detail. 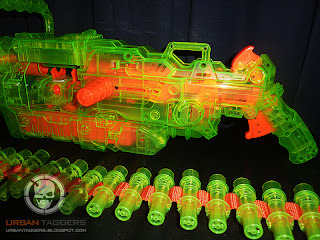 From the airwaves of CBS news in the US, it's been confirmed that "Nerf gun modifications can be dangerous"
Here it is folks; some detailed close ups of the much hyped and anticipated new Nerf Dart Tag blaster. 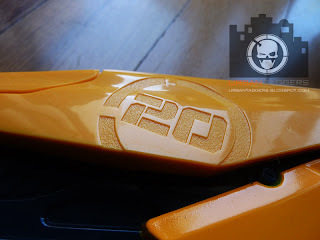 Our contacts in Taiwan have forwarded us through some fantastic intel on what looks like Bumblebee's arm cannon (and I really would not be surprised if this does have some form of movie tie-in when it IS released) and we here at Urban Taggers are pretty excited at the prospect of getting our hands on one. But for now.. on with the pics! Super Soaker 'Thunderstorm". Looks tuff. Really. 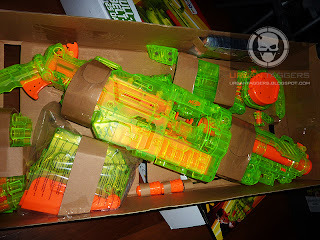 Our contacts in Taiwan have managed to get their hands on the unreleased Super Soaker we posted about a few weeks ago and have sent through some nice pics of what looks to be called the 'Thunderstorm'. It's bringing back the electronic water blasters that were oh so popular in the 80's.. and all I can say aesthetically at least, it's pretty damn hot.. The unit also looks like it's ready to be released which is pretty exciting..
Is the Barrel Break IX-2 any good? Personally we've stayed away from non-Nerf foam blasters, but the one blaster that is commonly mentioned as being on par if not better than the Nerf variety is the Buzz Bee Doubleshot. 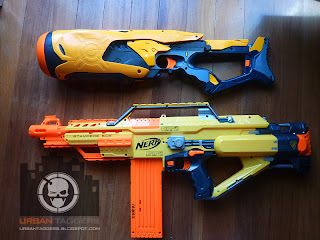 Nerf Mods + Reviews has a pretty tidy head to head comparison between the two, and while it's in the modded realm, it's still a great read. 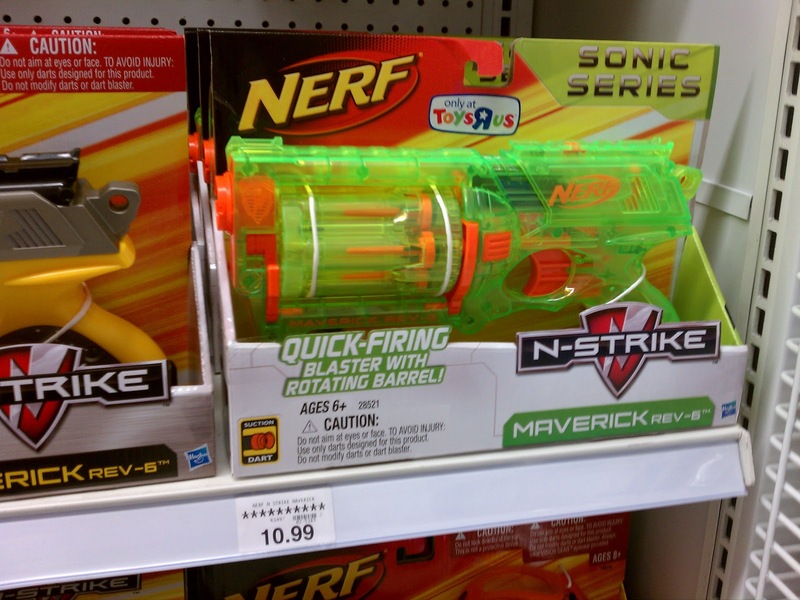 We're doing our best to keep you up to date on the latest blaster intel; we've confirmed the Sonic Series Recon CS-6 hitting the US stores a few days ago, now we've also got eyes that confirm the Maverick.. for $10.99US. Props to you again Dave! Software developer Ubisoft got a crazy panning a few months ago when they announced their self-described "hybrid" toy/game "Battle Tag". 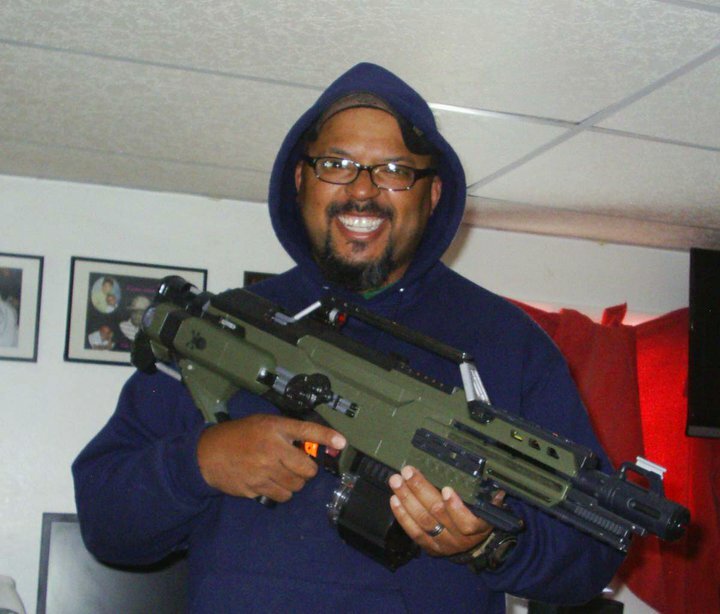 It's essentially a laser tag setup but one that gives you more than just the 'run and gun' blasting that we're accustomed to. Battle Tag incorporates some FPS style features such as health packs, ammo crates, and multiple game modes that you can customise via software and hook it up to your PC. 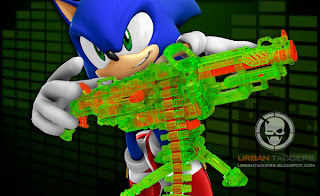 Sonic Series Recon CS-6. Spotted on shelf in TN. Thanks Dave! 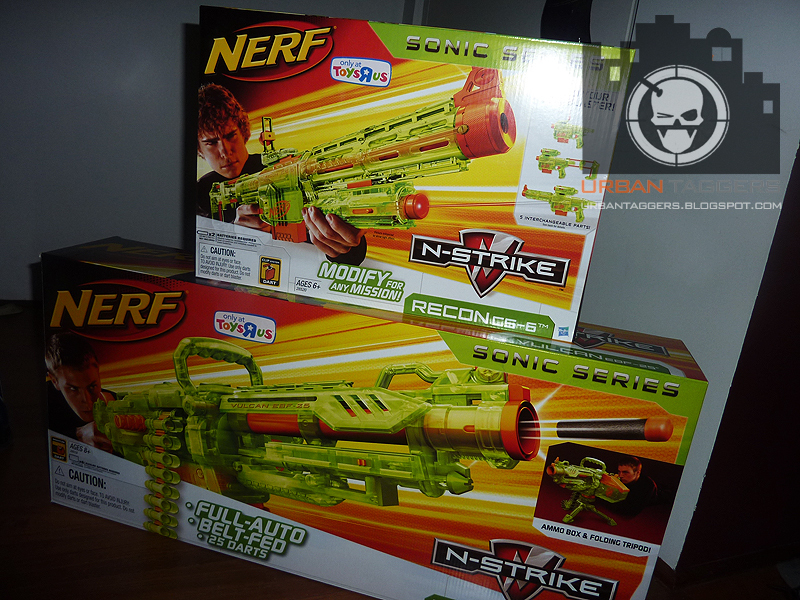 As spotted by one of our Urban Taggers readers, Sonic Series are now appearing on shelves in the US. 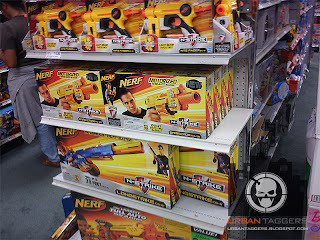 He sent through a pic of the above Recon CS-6 on shelf at his local Toys R Us. Looks pretty well priced too! Thanks for the intel, Dave! Alpha Trooper CS-18 with standard 6 round clip. Underwhelming. 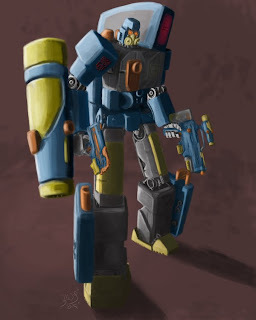 In celebration of Alpha Troopers making it to our shores Down Under, we've decided to put up some pics of AT configurations. The Alpha Trooper CS-18 is very rapidly becoming the blaster of choice for many Nerfers given it's sheer versatility, out of the box performance, Slam fire and a very cool 18 round drum. On the most part, it serves it's purpose well as is.. but of course.. with all N-Strike blasters, there's room for customising to suit your individual requirements..
Nerf in teams: How do you do it? 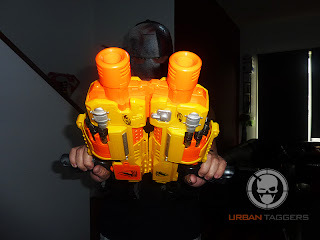 A few days ago I got talking with one of my neighbours whom I got into Nerf, and he made a suggestion to get his boys together and challenge us to a 5 a side underground carpark battle downstairs. 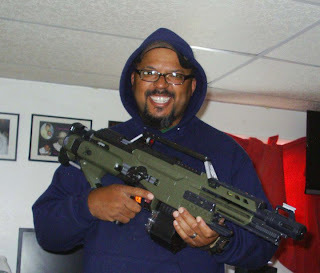 Now..although I stood firm on my "I don't Nerf war outdoors" tilt, I did considered this challenge and thought to myself... "well..a downstairs underground carpark isn't outdoors per se...". 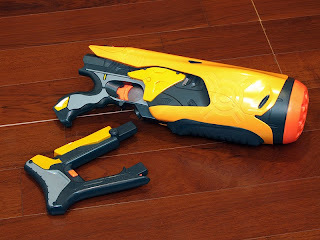 I spotted this on the unofficial, and thus mods-a-plenty Nerf page. J Wilson Jr does some seriously cool mods, and this is one of the hottest Stampedes I've seen. 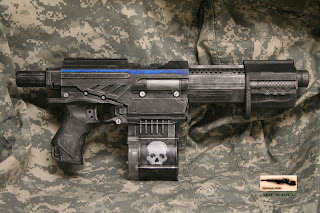 Not that I understand what most of this is, but other than the obvious aesthetic mods, he's done " double springs,bigger o-ring,AR'S removed,18 volt mod,silver green,and black paint,with 3 coats of clear coat and my skull logo, all kill switches wired to one switch "
Tell me that's not inspired by Bumblebee! $160 bucks on ebay. Worth it? 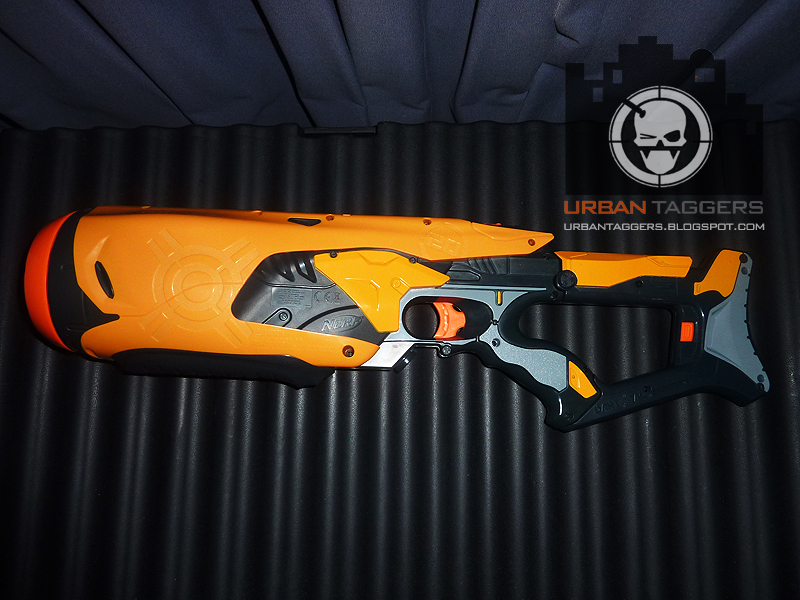 I dunno..
Nerf's N-Strike line aren't the only blasters receiving the battery powered treatment. 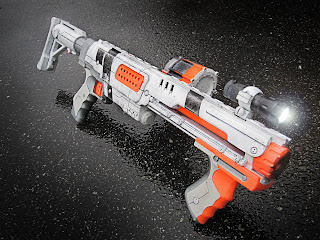 Behold the Nerf Super Soaker Thunderstorm; a fully automatic water blaster. 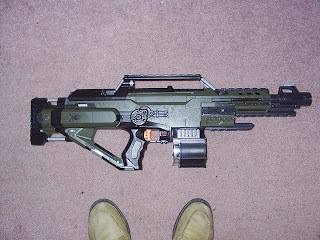 From what I can gather, it has N-Strike compatible tactical rails, runs on 4 AA batteries and comes with a water "clip", much like the way the CS series go. It can support all N-Strike stocks as well, and the clip looks like it's got a belt clip to attach to your boardies. Electronic water blasters have never really been that fantastic for range and performance, so it'll be interesting to see if Nerf can do any better. More intel as I find out more! 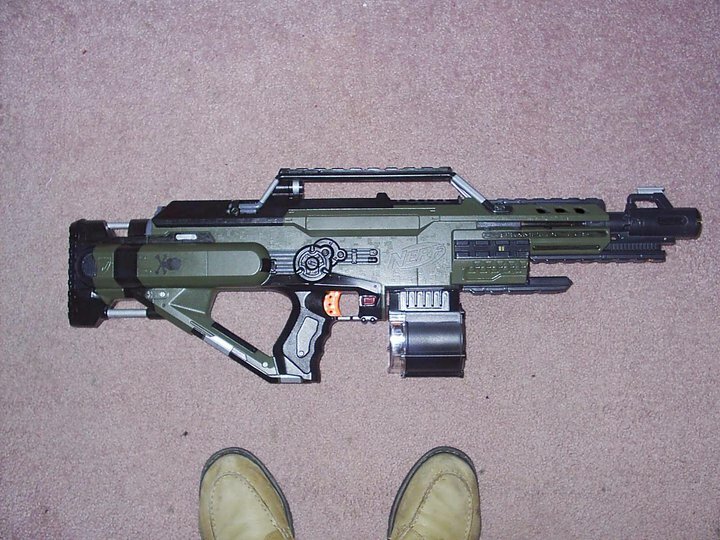 There's a guy selling one on ebay, however it is out of packaging and "as is" so the asking price for $120US is a little steep. Call of Duty:Black Ops Prestige Edition RC-XD. Coooool! Ok where are my priorities?! 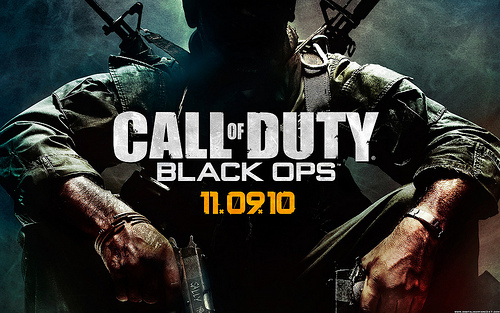 Call of Duty: Black Ops is one of the most anticipated video games of 2010 and expected to top the king of first person shooters, it's predecessor Modern Warfare 2. 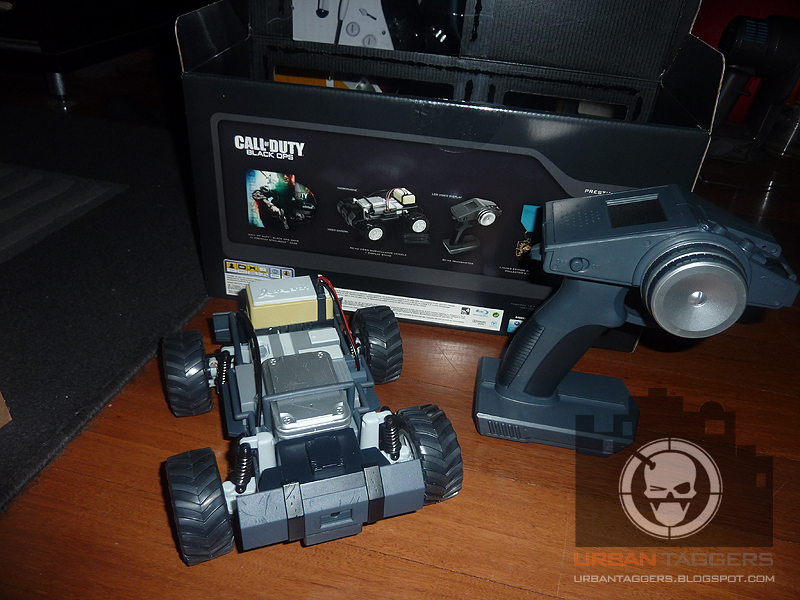 One of the ways to pre-order the game was the special "Prestige Edition", which along with various other things, comes with a radio controlled vehicle, modeled after an explosive device in the game. Although it doesn't explode, it DOES come with an on board video surveillance camera in its nose which transmits back to the controller. "It's not official! It doesn't exist! It's..oh.."
I'm not sure I can get more "official" than this. A stroll through my local Target, Canberra Centre had me seeing several boxes of Barricade RV-10's on the shelf, not to mention several more sitting on a storage cage in the next aisle. $34 AUS. For those of you using your phones to view this and can't see the kevinericon's video of the new blaster, we did some screen caps:) More images after the jump. Rumours: Nerf Dart Tag 20 Automatic Blaster..
Youtube Nerf affectionado "Kevinericon" always has a great 'in' on the newest Nerf gear around. Check this video out and tell me that doesn't make you just a LIL' bit excited. No sticker logos suggests it might be a pre-release model (and he has no comments or details on this blaster in the description thus far) but the Dart Tag logo etched/embossed in the plastic suggests it's Nerf. 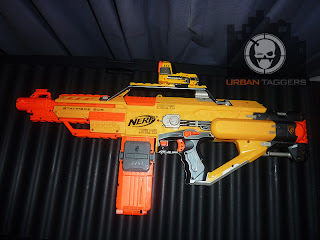 From what we can tell from the vid, it's fully automatic (more like the power up when you fire like the Vulcan vs the constant flywheel whirling of the Barricade or air pressure like the Magstrike), has a detachable stock and an awesome rotating barrel that fires 20 rounds of foam dart goodness.. UPDATE: Apparently it takes 6 C cell batteries. More news as I come of it.. Thanks to Neil at the Canberra and Southern NSW Dart Tag crew for sending me this! Today, and (probably for the rest of the week) will be pretty quiet for us here at Urban Taggers; mainly because Call of Duty: Black Ops was released and ALL of my fellow tagger/blaster cohorts have locked themselves in their houses for the past 15 hrs and are incommunicado other than through gaming headsets. It also shows in our user stats; we just had a massive dip by almost half in readership today:P Had me somewhat worried and I was wondering what was going on..and then it hit me when I couldn't get a hold of any of my male friends all morning! It's hot! It's new! It's..a..hatchet! 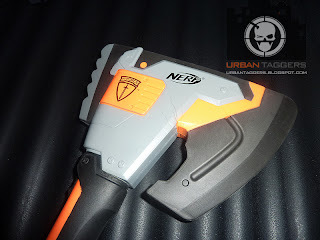 For the inner Iroquois in you, Nerf have released their new N-Force Klaw Hatchet. I picked up a pair of these today from an etailer in the US, and have spent the past hour or so flapping around like a chicken, dual wielding these puppies against the pigeons outside. More Nerf blaster mix and matches for the week as requested by you; happy to accommodate where I can. Post your requests on the Facebook page and I'll do my best to get you the pics! Dual wielding shotguns? tonka tuff and then some. 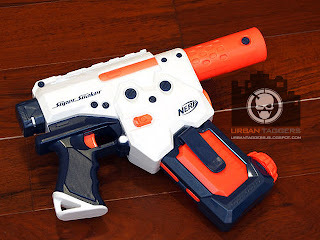 Nerf's Barrel Break IX-2 is an interesting blaster in that OFFICIALLY it's semi automatic.. but you feel stupid saying that given it only fires off two rounds. 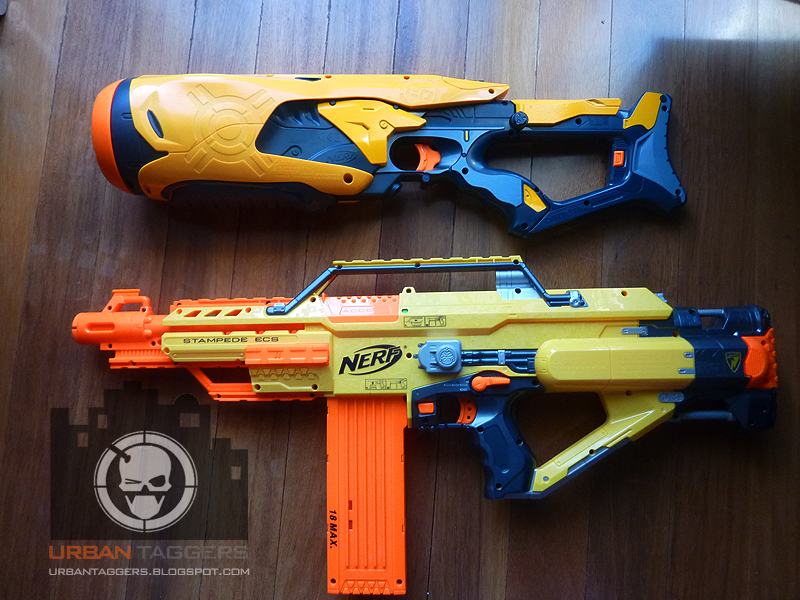 It has versatility in that you can fire off those two rounds either one AFTER the other, or both at the same time. But.. it's still.. only two rounds. SO what would happen if you dual wielded a pair of them? Well to put it bluntly.. you'd have.. 4 rounds. 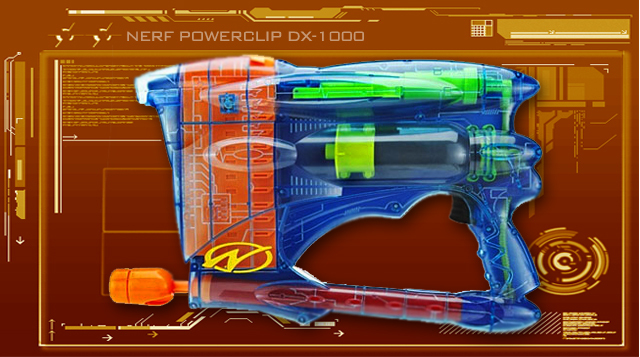 Nerf Powerclip DX-1000. See-thru goodness. 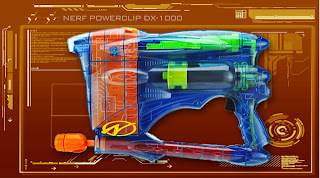 The Nerf Powerclip DX-1000 was a 10 round air pressure powered fully automatic blaster that came out in the early part of the decade and can easily be described as a predecessor to the Magstrike AS-10. 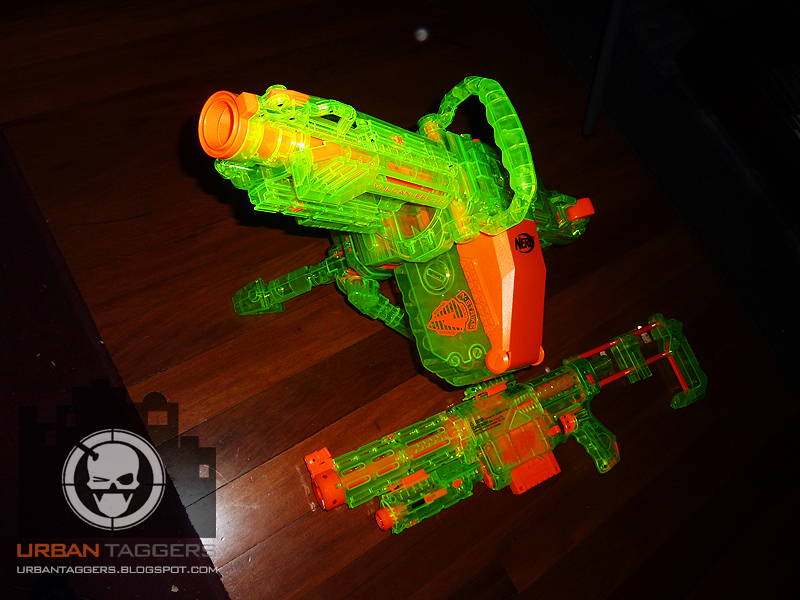 It also used a 10 round clip that rapidly advanced upwards but unlike the Magstrike, the clip was not removable. 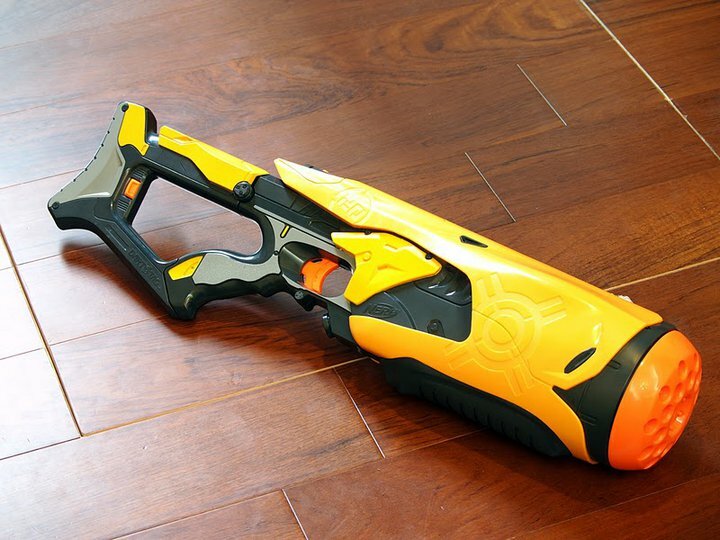 Although discontinued, it is still a very powerful, formidable blaster that holds its own in any Nerf battle. Barrel Break IX2.. but not like you've ever seen before. It's like a mirror..yet not. 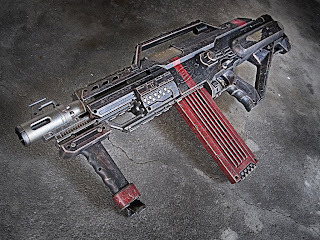 The main appeal of the Barricade RV-10 (the upcoming worst-kept-secret-ever blaster), is the fact it is a hand held semi-automatic blaster that can shoot a decent 10 rounds without requiring any priming. This in turn lends itself to the muchas desirable dual wielding John Woo movie style, which is just a crazy fan favourite amongst.. well pretty much everyone. The main disadvantage of the Barricade RV-10 is the ridiculous noise that comes from the electric flywheel firing mechanism. 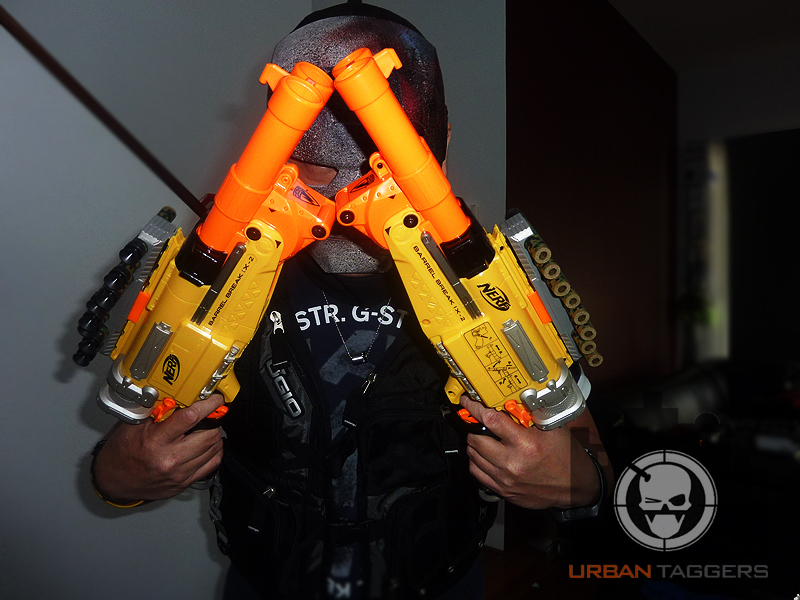 Now.. comes the test we've all been waiting for..how does it feel dual wielding TWO Barricade RV-10s? 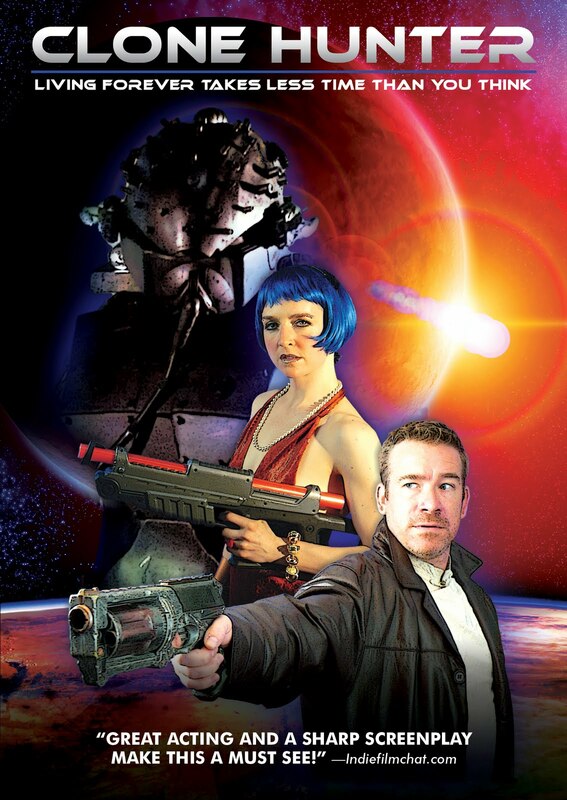 Nerf blasters are just the weapons of choice for the props departments of b-grade movies.. check out this poster for "Clone Hunter".. the blaster doesn't really feature in the trailer though. I love this one. 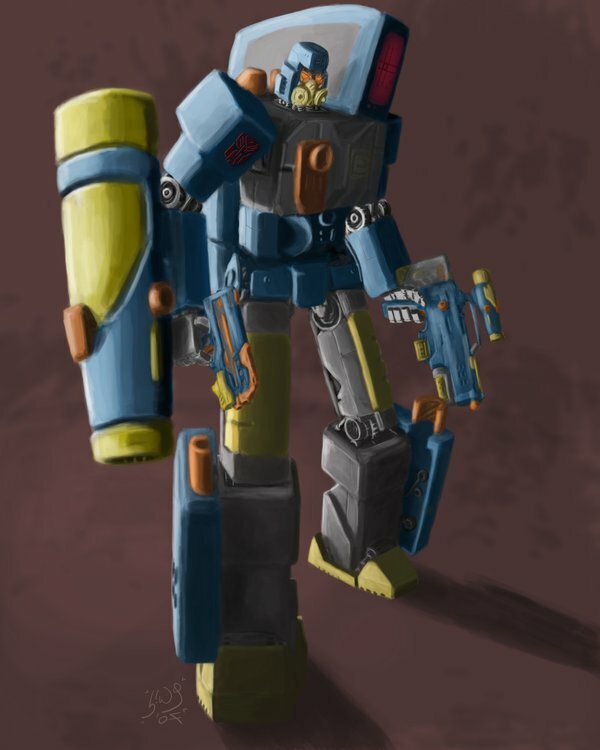 Courtesy of MeanandMunch via deviantART. Nerf Rapidfire AS-20. Been around for a while. The Nerf Rapidfire AS-20 is the largest capacity air pressure blaster in the N-Strike range, although historically it had existed for several years prior to the N-Strike banner (albeit with a different colour scheme). 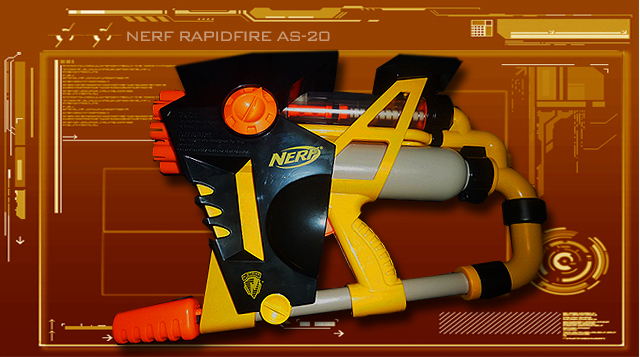 As the name suggests, the Rapidfire AS-20 boasts 20 foam dart rounds in a fully automatic flurry of air pressure powered madness which is still pretty awesome, even against the likes of newer blasters like the Vulcan and Stampede.